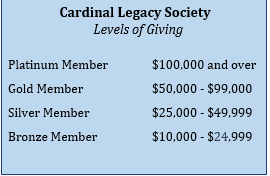 What is the Cardinal Legacy Society? Enrollment in The Cardinal Legacy Society is offered to all those who share a commitment to the educational and spiritual growth of our students, who endorse the mission of the DuBois Central Catholic and who affirm that commitment by means of a planned or outright gift (at a minimum level of $10,000). To become eligible for The Cardinal Legacy Society membership, an individual must inform the School in writing that the DuBois Central Catholic has been included in his or her estate plans. The School requires documentation of the planned gift, for example a copy of the life insurance policy with the school’s name as beneficiary, or a copy of the provisions of the individual’s will or trust will be acceptable. 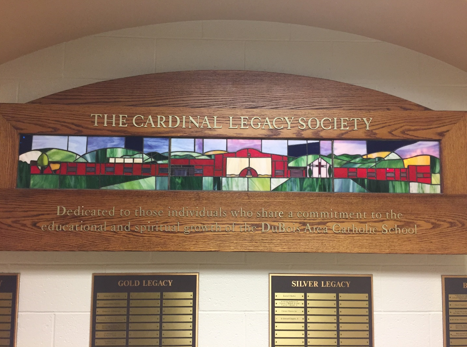 All gifts greater than $10,000 will be given permanent recognition (upon receipt of gift) on The Cardinal Legacy Society plaque at the DuBois Central Catholic.